Situated off the Western coast of Spain and engulfed in culture, cuisine and art, Portugal is fast becoming the hottest spot to visit in Europe. There’s no question as to why either. Think of yourself being surrounded by the most genuine people, all the while remaining inspired by a beautiful country. Check out my top picks for the top eat, sleeps and views in Lisbon, Portugal. A colourful city surrounded by narrow cobblestone sidewalks, err, streets rather, the classic yellow cable cars and of course, tuk-tuks honking about. This is a city like no other. A friendly, welcoming hotel with a chic interior and the best breakfast buffet you could ask for – order the customized omelettes and espresso. Decked out in shiny floors, marble tables and cream-coloured chairs in the lobby, this hotel puts your worries at ease for travelling to a new place with their helpful staff at reception and eager to please concierge. Take a dip in their indoor pool outfitted in the typical Portuguese tiles amid the stunning blue hue and once you’re cooled off, get some R&R on their patio outside overlooking the busy city. If you’re a fan of a restaurant overlooking a bridge (much like the golden gate bridge in San Francisco) amid a beautiful viewpoint of the marina at the Alcantara docks than this should be your go-to spot. Not only does it offer sweeping views of boats and yachts, but it serves some of the best seafood around. Opt for the grilled sea bass, it’s to die for – just watch out for the bones. For desert, let the glasses of Portugal’s famous port flow alongside platters of pastries. Start at the Port of Lisbon for a day of adventures and walk through the colourful streets and alleys. Grab a bite to eat at the oldest restaurant in Lisbon, Café Restaurante Martinho Da Arcada for a real cultural taste of the city. Take the metro to Belem and visit the Torre de Uclem, a fortified tower that is a symbol of Lisbon and a UNESCO world monument. Dip a toe into the cultural commercial square (read: Praca do Comercio) and visit the Jeronimos Monastery and the Maritime Museum for a good dose of history. Next, catch a tuk-tuk back and towards the Alfama Portas do Sol, which is the oldest Moorish district in Lisbon. Stop at a charming shop called Ai Maria for a shot of Ginja, a Portuguese liqueur made by infusing ginja berries in a chocolate cup. Tour around the Alfama district for a wide breadth of culture amid the narrow, old cobblestone streets and whitewashed houses surrounding. Afterward, hop back on the tuk-tuk where your friendly tour guide will take you to the best lookout point in the city at the Miradouro de Santa Luzia monument. Snap a selfie while you’re at it. 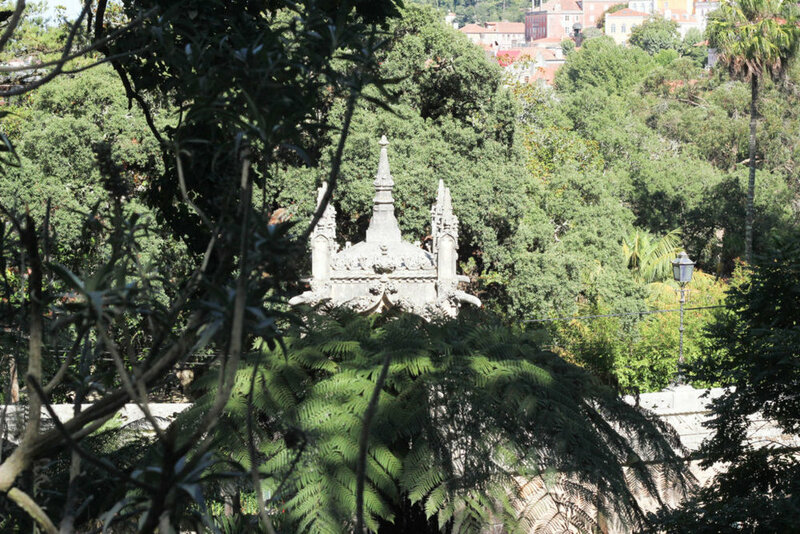 You can’t visit Lisbon without checking out Sintra and its multitude of beautiful, breathtaking palaces and castles. If you’re in shape and wanting to get a workout, hike up to the Pena Palace in Lisbon, or for those wanting to save their calves, catch a bus to the top. This hike is not for the faint of heart though, but the ascent is worth it for the tour at the top. The Pena Palace is engulfed in bright oranges, yellows and blue tiles, one of the prettiest palaces you could ever lay your eyes on. While in Sintra, visit the Quinta de Regaleira castle, which, while it isn’t decorated in bright colours like Pena, it makes up for in intricate gothic renaissance styles. Lisbon is the capital of Portugal, so there is great shopping around; it’s a mixture of the designer retailer stores and local Portuguese shops too. I even picked up my Dior sunglasses at the Dior store in town. Drive to Carvoeiro, in the Algarve region. This region is the utmost southern part of the country’s coastline. The Algarve should definitely be on your list as it has much to offer, think the famous orange cliffs, caves, lagoons and the bluest water there is. There is much to explore while you’re here and it’s a great place to get some well deserved R&R. This hotel has the best view money can buy, with a pool situated right in front of the ocean and the stunning rugged caves. Spend a day by the water and walk down to the village for dinner. Just a few minutes away from the hotel, take a trek down to the village and go for the best Italian in Portugal at Villa Medici. For appetizers, opt for the garlic pizza, yes it’s a thing and it’s fabulous. Do: Drive up to Cape St. Vincent, next to the Sagres Point, in Algarve, southern Portugal where you will find a handful of surfers descending the steps of the cliffs to the water. This place isn’t a huge tourist trap, and should definitely be on your list. The Romans liked it too as they used to think of it as the “End of the World’ because they considered it a magical place where the sunset was much larger than anywhere else, and because it’s the south-westernmost part of Portugal closest to Africa. The view is as far as the eye can see, with rocky cliffs just below you and the bright turquoise blue ocean, there is really no place like it. Leave early and drive to Evora, one of the hottest cities in Europe, get some culture in and visit the Igreja de São Francisco, one of the most prominent Gothic monuments in Portugal. This cathedral is gilded in gold, and intricate woodwork, covering almost the entire church; it’s considered one of the most outstanding of Portugal. Next, walk over to the Chapel of Bones, where yes, you guessed it, the interior walls are covered with human skulls and bones. There is a message waiting for you upon arrival (“We bones that here are, for yours await”). Pretty crazy, cool too. After a long day out exploring, drive to Cascais, Europe’s version of the Hampton’s. What was once a sleepy fishing village, Cascais is now a bustling beach town. Change things up and stay at a fort, well, in my opinion, what was really a castle. Whether you’re looking for a relaxing spot right on the beach with the sounds of crashing waves, or a quiet place to get some work done, this is the place to stay. Boasting views of the waves crashing on the shore, and the rugged rocks below, Fortaleza de Guincho presents a true European experience. With suites outfitted in gilded wooden décor, round rustic doors, and sprawling bedrooms with embroidered drapes there is not much else you need. The bathrooms are even enriched in the original Portuguese blue tile, complete with Hermès products, proving this is the place to be when you’re in need of a beach oasis. Stay in the hotel for dinner and eat at the world-renowned restaurant where you will find the best fish and seafood from the Portuguese coast as well as the highest quality of service, with a Michelin 1*. This isn’t a fast dining restaurant, this is all about the experience, with a philosophy based and inspired by the Atlantic, you get the true feel for the Portuguese cuisine. Opt for the Sea Bream, a delectable white fish served with fennel and barley, and try the Memories of my Childhood for dessert, served with plums, chocolate, and edible flowers. See you next time, Portugal!